St. Petersburg will celebrate Earth Day with a community celebration to be held in Historic Williams Park. 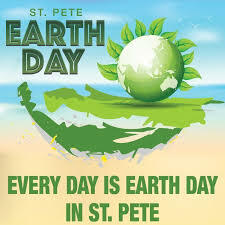 Earth Day is celebrated by over a billion people in hundreds of countries around the globe. By celebrating Earth Day we join with others and share our common reverence and respect for this beautiful but fragile planet.